DIVE AGAINST DEBRIS "PROJECT AWARE"
So you are looking to dive for lobster? Learn how to do it like the Pros! Book your lobster dive trip now because space is limited and fills up quickly. One of the most amazing beach dives in North America, and all within 30 feet! Spend the weekend diving the amazing reefs within reach of the beaches of Fort Lauderdale! Some of Florida's amazing reefs and wrecks lie in the waters around Fort Lauderdale in South Florida. Watch as it comes alive at night! Some of Florida's amazing reefs and wrecks lie in the waters around Fort Lauderdale in South Florida, go see them on this 5 dive trip! The diving in the Florida Keys is famous for it's beautiful blue, clear waters and spectacular coral reefs teeming with life! Enjoy the easy life floating along with these spectacular drift dives off of West Palm Beach plus an awesome night dive at the beautiful Blue Heron Bridge! Have you ever peered with curiosity into an underwater cavern? If you have, you may have experienced a little excitement along with a bit of fearful wonder as your heart races with intrigue. After successfully earning your PADI cavern certification, you will be trained to explore these sunlit spaces safely. Many of the dives done in the ocean off the Florida coastline and rivers have a current. This course will teach you how to safely dive in a current and how to maximize the quality of your diving experience. Get the sensation of flying over the bottom of the ocean by perfecting your Drift Diving abilities. 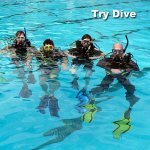 Learn how to dive without getting wet! Great for cold water divers. You’ll learn about dive injuries, different types of emergency oxygen equipment and safety considerations when using oxygen. Youâ€™ll learn why diving with air that has higher oxygen and lower nitrogen content gives you more bottom time, along with enriched air equipment considerations. Ever come up from a dive and asked the guide what sort of fish you have just seen? One of the main reasons we all dive is to see the amazing marine life so it only makes sense to learn the names of the beautiful underwater life. Come and learn the freedom of Free diving! Join one of our professional staff to safely extend your personal limits and abilities without the weight of a tank. A great course for all divers! This course focuses on air consumption with normal results dropping the individuals air consumption by 33% after the course. Buoyancy is a great asset to a dive and a must around the sensitive coral reefs and wrecks of Florida. Widely regarded as PADI’s best course. This is your opportunity to take your abilities to the stage where you are not only capable of taking care of yourself but also others on and before the dive. The most common mistakes divers make are down to poor navigation skills. During this course you will learn many ways to navigate both with the traditional compass and also by using natural navigation that most dive instructors use. Florida has a great selection of wrecks from aircraft carriers to small sail boats. If you are interested in learning how to wreck dive, Florida is a great place to do so. Join Mark Hatter for a Pro Level Photography Class. Mark is an incredible published photographer and journalist. He has set up a great class for those of you already comfortable with your cameras to help you move to the next level. Have you always wondered what it?s like to breathe underwater? If you want to try scuba diving, but aren?t quite ready to take the plunge into a certification course, Try DIVE is for you. We offer this program either in a pool. Try dive is a quick and easy introduction to what it takes to explore the underwater world. Reactivate your diving skills, dust off your gear and jump back in with one of our knowledgeable and skilled team members! Join us for a trip on a beautiful spring and meet Virgil !!!!! A quick and easy introduction into what it takes to explore the underwater world. Although this is not a scuba certification course, you'll learn all the steps it takes to be diver.